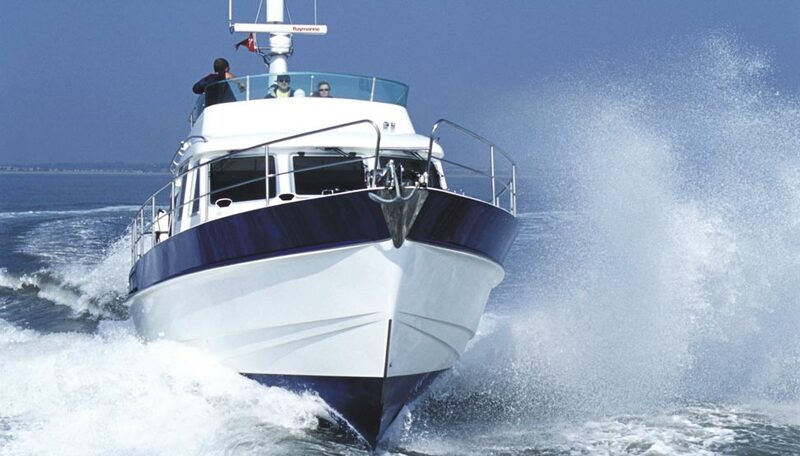 When you are looking to buy a boat you want to deal with an established company with a first-class reputation, which makes high quality products with excellent engineering, outstanding sea-keeping, luxurious interiors and also offers after sales support that’s second to none. We have been builders of sturdy, all-weather motor boats for 40 years, delivering a range that meets a wide spectrum of requirements from the Hardy 20 to our magnificent Hardy 65 – and many more in between. We are delighted that the Hardy name has become synonymous with quality, comfort, strength, experience and excellent sea-keeping, which has resulted in a loyal customer base, many of whom have bought from us a number of times and enjoy the good second-hand values our boats attract. Excellent products are backed up by our commitment to looking after our customers – our after sales support is exemplary and provided directly by the boatyard team. 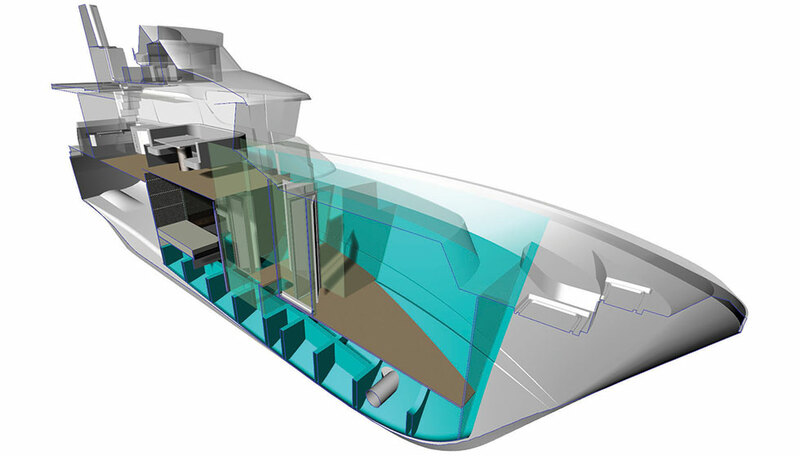 From the Hardy 26 up, the hulls are semi-displacement designs from the board of Andrew Wolstenholme, arguably the UK’s leading naval architect in this category. The hulls are designed to give a smooth and comfortable ride, with exceptional endurance in tough weather conditions. Speeds of up to 30 knots are possible, but these hulls are equally comfortable at slower speeds while owners enjoy the sun and the view – the best of both worlds. Their relatively low freeboard means that boarding from alongside is easy, and the substantial bulwarks and solid guardrails make movement on deck safe and secure. Our motor yachts are built up to a standard rather than down to a price and throughout, the emphasis is on strength, safety and reliability. We differ from our competitors, some of which are ‘production’ boatbuilders, in that Hardy boats are generally built to individual order and considerable customisation is possible. This can include engine installation choices to suit the buyer’s cruising plans, layout alterations and different interiors ranging from the classic teak look to a more contemporary style. Owner involvement in the planning of each boat is actively encouraged, which means that every one we launch is totally unique. We hope you enjoy looking at this website and that it will lead to an opportunity to meet you and tell you more about our company and range of motor boats. At Hardy Marine, we use the very latest design technology to achieve accuracy, continuity and the best possible use of space. Our designs are typically drawn up using 3D modelling techniques, combined with our full range of wood machinery and specialist equipment, including digitisers and CNC machines – all of which enables us to produce joinery to an extremely high quality. Equipment locations, wiring and plumbing runs are meticulously pre-planned to give optimal service access and we are committed to long-term customer support – we can even now supply a precisely-sized match for a damaged joinery panel years after handover. As well as Andrew Wolstenholme’s talents, we also use specialist design studios such as Synolo Design Ltd for interior customisation and styling. By generating images from the 3D design model, we can show buyers the effect of layout changes and different interior timbers and finishes, making it easy for owners to see how it looks and select their preference. Our designs are moderate displacement, so there’s no need to cut the laminate to the bare minimum – in fact, the GRP construction is of the ‘belt and braces’ variety. Gel and outer skin resins are chosen for colour fade resistance and impermeability to water. Hardy’s engineering standards are exemplary and systems are installed with reliability and easy access as priorities. The knowledge built up over 40 years also means we can avoid potential problems – as an example, domestic freshwater plumbing is insulated to help prevent problems in the winter. We also offer choice – for instance on the electrical side, we have experience of various digital switching systems such as Empirbus and CZone for those buyers who want to incorporate the latest technology. Timber finishes are selected with great care – whether for teak decking or interior joinery. On the larger Hardy models, the marine plywood used is veneered specifically for the yacht in question, so that the colour and grain pattern is matched throughout the vessel. We actively encourage owners to be closely involved throughout the build process. There are a multitude of decisions to be taken and choices to be made in creating a semi-custom vessel, but we are on hand to guide and advise throughout. In fact, we are as motivated as the buyers to ‘get it right’, as our best sales team are our happy owners! 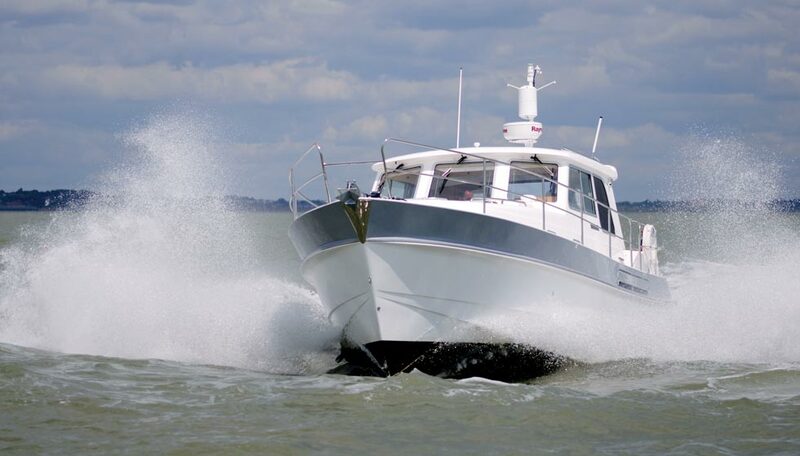 Our boats are extensively tested prior to handover from our commissioning base in Ipswich. After that we support the boat and the owner ourselves directly from the yard so that they have the confidence of knowing that they can call for advice or assistance 24/7. 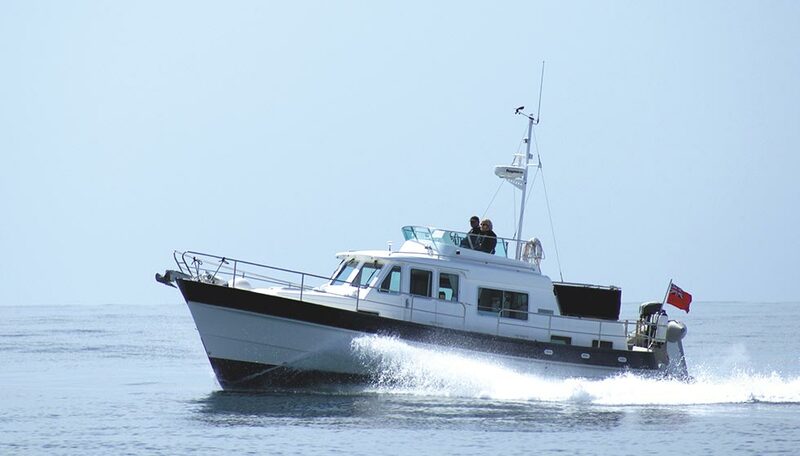 The Hardy 32 was designed in response to requests from potential owners who wanted an aft cockpit design suitable for cruising the French canals, but also retaining the speed and sea-keeping ability to cruise across the English Channel or the North Sea in comfort and safety. The Hardy 32 fulfils all these requirements and more. A sea boat utilizing the ever popular design of the Commodore 36 with its eye catching classic lines and a proper sea-going hull. Now a version without a flybridge for those people that are looking to cruise the French Canals and also have a large sociable aft cockpit. Windboats Hardy Motor Boats Ltd first new model since their takeover of the assets of Hardy Marine. To ensure that the legendary sea keeping design of the Hardy range remains intact, the design of the Hardy 40DS remained in the capable hands of Hardy designer Andrew Wolstenholme. 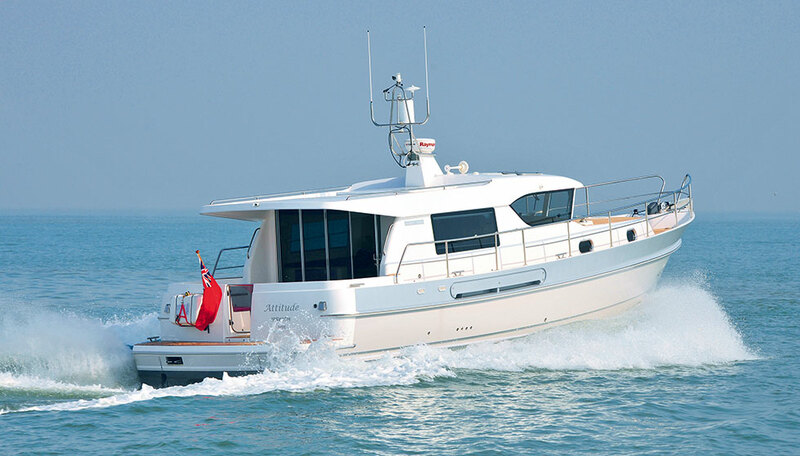 Designed to build on the reputation of the Hardy 36, the Hardy 42 is a top quality sea-kindly cruising boat with lively performance. 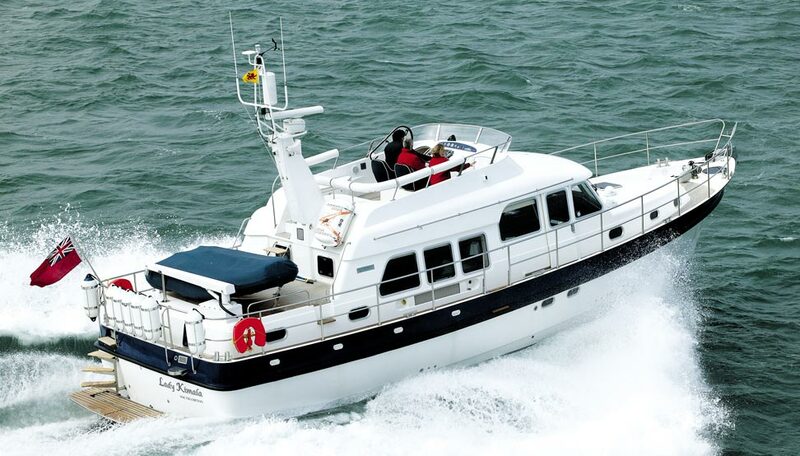 The latest Hardy 42’s are capable of nearly 28 knots in heavy weather in comfort. 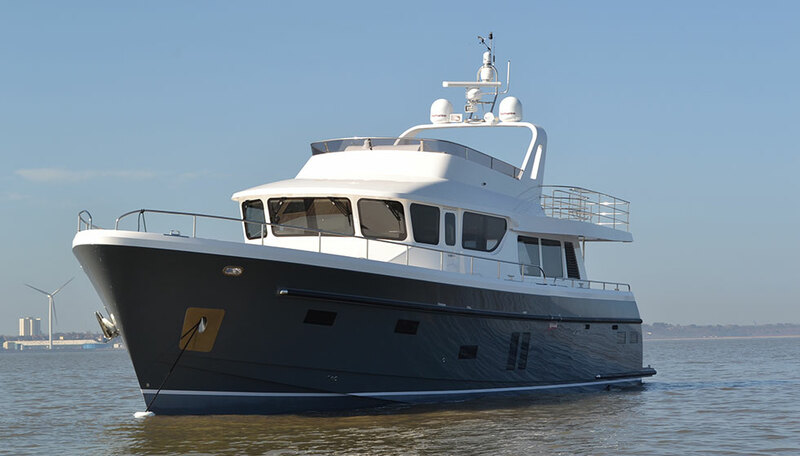 After the introduction of the Hardy 42 it became clear that a number of owners would welcome a larger luxury motor yacht with similar performance and sea-keeping to match. The new design has a size and layout that allows a larger family to cruise together, but be manageable by a couple for long periods and distances. The Flag Ship of the Hardy range offers a sea kindly semi displacement hull built to withstand the vigour of the sea. The design is typical of the Hardy approach to cruising motor yachts. The interior may be styled in either a traditional manner or lifted to give a more modern feel.